What looks like an entertainment company, spends like an entertainment company and programs like an entertainment company? It's Hasbro, a toymaker. Over the last few years, the company has poured billions of dollars into (and received billions of dollars from) big-budget movies and triple-A video games, plus a joint-venture cable network called The Hub (a costly misstep), which since was rebranded and partially sold back to partner Discovery. And now, Hasbro is trying something new. TV product created and licensed by Hasbro is going in a number of different directions this year. A few of the shows are still in premieres on The Hub—or rather, Discovery Family, as it is now known—and there's a brand new Transformers series on Cartoon Network. And yet, the toymaker was emphasizing everything digital at Toy Fair last week, and in that respect, its executions are impressive. Each Transformers toy is modeled on his animated counterpart and has an emblem that kids can scan into Mom's tablet or smartphone for use with the Transformers action-game app. It is a model pioneered by Activision and its wildly popular Skylanders toys—buy a toy, play with it in a video game—but Hasbro deploys the idea across several different lines of greatly more complex toys than the Skylanders figurines, including My Little Pony and Littlest Pet Shop. Projects like The Hub and disappointing films like Battleship might not have worked the way Hasbro wanted, but the company is, if anything, even more committed to TV and film today. "Storytelling is really central to everything that Hasbro does," says Stephen Davis, Hasbro's chief content officer. The company has changed the structure of Hasbro Studios and launched Allspark Pictures, a production company that will release its first feature, Jem and the Holograms, in October. The newer, leaner production company "allows us to make more modestly budgeted films so that we can control the content and the calendarization," Davis explains. (Pretty much every other Hasbro film has swung for the fences in budgetary terms.) Other kids' content is free-floating—it can live on tablets and phones, in the film world, video games and comic books. That's a sound strategy, since kids' TV ratings are plummeting. In the key kids 2-11 demographic, Nickelodeon was off by 15 percent in average total day viewing last year, while Disney Channel was down 22 percent and Cartoon Network was flat. Among kids 6-11, the story is essentially the same. It's a bad time to be in distribution, but a great time to be creating new shows because everyone is desperate for content that will resonate with kids. The content strategy Davis describes is a lot more staid in terms of raw investment than recent history indicates. Fresh off the success of 2007's big-screen Transformers, Hasbro expanded beyond content licensing into high-end production and distribution. And for a moment, it seemed like the toymaker was poised to become another multifaceted entertainment conglomerate—but only for a moment. After an initial expenditure in 2009 of $300 million for an even stake in The Hub with Discovery, plus production costs, The Hub finally called it quits last year. It just wasn't making money fast enough. One former staffer at the network is fairly clear about what went wrong. Hasbro grossly overestimated the amount of money The Hub would be able to make. "Cable networks take time," explains the insider. "It was growing at a reasonable rate, but it was only making $9 million a year [before the sale]. … [Hasbro is] a toy company. They didn't know how to run a cable network, and Discovery was AWOL the entire time. They considered Hasbro first among equals because they'd paid so much for it." In part, The Hub also suffered from inauspicious timing. The much higher-profile growing pains of the Oprah Winfrey Network drew Discovery's attention away from Hasbro where at least there was a clear vision, good programming and polite buzz. Ultimately, Hasbro turned full operational control back over to Discovery after the network's CEO, kids programming legend Margaret Loesch, left at the end of last year. (Hasbro CEO Brian Goldner gave Loesch's departure as the reason to sell back its ownership stake.) "Hasbro is a good company and Discovery is a good company," acknowledges one former Hub exec. "In my opinion, Hasbro realized over time that they overpaid for their share, and that was a great worry for them. They had an opportunity to reduce their position, and they took it." A source inside Discovery who asked not to be named in this story offered the following comment: "There are absolutely no problems with the relationship with Hasbro then or now. The transition we made was based on changes in the kids business, primarily more children watching SVOD. We want people to watch the best of what Hasbro brings to the table and the best of what Discovery brings to the table." Davis takes a diplomatic tack as well. "We decided with respect to Transformers that it deserved to be on a network [Cartoon] that had a much broader, older-boy-skewed demo," says Davis. "But we continue to produce a significant raft of shows for Discovery Family. We're still very committed to the success of that network." Any TV professional will blithely assert that good content will win out eventually. That, of course, isn't always the case. 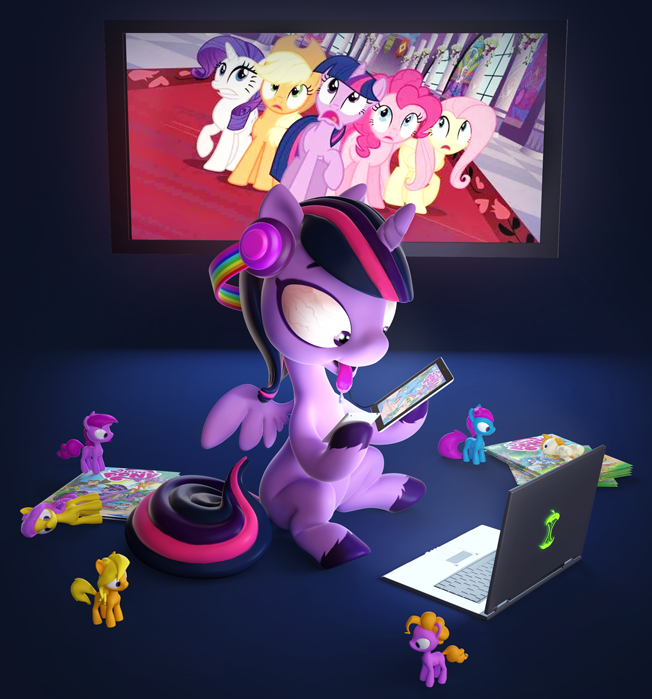 The Hub had awesome content, including Transformers: Prime, which won nine Daytime Emmy Awards over three seasons, as well as a breakout hit in the creepily beloved My Little Pony Friendship Is Magic (It's good! It's just not The Brothers Karamazov! Don't hurt us, Bronies!) and a stylish G.I. Joe cartoon. Despite those bona fides, vital advertisers went missing. The Hub never attracted a single ad from the two largest toymakers in the world—Mattel and Lego—because Hasbro was their competitor. "Back in the day, you just had to be on Saturday mornings," recalls one veteran media buyer—it didn't matter whether or not you were selling Barbies and your spots ran on My Little Pony. "You didn't have Cartoon or Nickelodeon." With The Hub, the problem was that Hasbro was an owner, not just an IP provider. "It wasn't that the programming was a competitive brand," adds the buyer. "It was saying, 'Oh, hey, Mattel and Lego, part of your media dollars are making it back to Hasbro.' It wasn't the content at all." "It would have gotten there, though," the buyer adds. GRPs, after all, are limited in the kids market. Once you have enough people watching, clients marketing kids products can't afford to ignore you. Here's what continues to keep Hasbro in the game. When it comes to individual brand identity, it has the market cornered among young parents, perhaps even more effectively than Lego. If you grew up in the '80s, Hasbro is synonymous with children's entertainment. The company took advantage of looser regulations on kids programming starting in 1982, when then-FCC chairman Mark Fowler let it be known that he'd relax the rules around toy tie-ins. The resulting programming struck a chord with young people in a major way. Marvel Comics built elaborate stories around Transformers and G.I. Joe for Hasbro, and those lines and others (My Little Pony, Jem) became syndicated Saturday morning mainstays. Loesch worked on them, in fact. Hasbro's business acumen in the toy aisles is undisputed—even the most disillusioned former Hub employee interviewed for this story conceded that the company is "very good at selling toys." The reason the company has lasted so long is both simple and fiendishly difficult to reproduce. Optimus Prime, Cobra Commander and Jem are all characters with distinct personalities and stories attached to them, whether they're on the screen or in your hand. That's a serious advantage with an entire generation who are now parents—which is what any toy company wants. "If you've got a content play and you've got a toy coming out of it, that's where you want to be," says the buyer. "Lego's got its movies—those are ads in and of themselves." Traditional TV may be cratering, but video consumption isn't, and you can't have Transformers: Prime without Transformers. Hasbro has another advantage. The "master" license for a primo piece of intellectual property is one of the most coveted contracts in the toy world. If you can do it right—as the jaw-droppingly lucrative licensing deal Mattel and Disney/Pixar Cars did—you can make billions. Licensed toys accounted for nearly one-third of $5.7 billion in revenue at toymakers last year, which analyst NPD Group credited mainly to toy lines from Disney's Frozen. In a major toy-world upset—the equivalent of the Chicago Cubs winning the World Series—Disney declined to renew Mattel's master license in September, giving it to Hasbro. Mattel's CEO resigned last month. The new lines presented at Toy Fair in New York last week were based on the upcoming Descendants movie on the Disney Channel, but starting in 2016, Hasbro will also have the rights to sell Frozen dolls, which should dovetail nicely with the upcoming stage musical and whatever sequel may happen. It's a blow to Mattel's girl-centric business and helps Hasbro round out its portfolio. The deal also points to a deepening relationship between Disney and Hasbro. Disney is far and away the biggest licensor Hasbro has. And Disney owns Marvel and Star Wars—both giving way to big movies this year but also part of Disney's own nascent action-cartoon network, Disney XD. The Marvel license alone is worth nearly $400 million over the course of its multiyear span, according to a source familiar with the contract. When there was brief talk of DreamWorks Animation merging with or selling to the toy company last year, Disney reacted swiftly and angrily. If either outcome happened, according to The Hollywood Reporter, Disney said Hasbro would be jeopardizing contracts worth one-third of its business. Needless to say, the move didn't go forward. Where are Hasbro's proprietary TV shows now? Well, everywhere. Old shows from The Hub still run on Discovery Family, and several, including My Little Pony Friendship Is Magic, will continue to premiere on the network for another season. Transformers: Robots in Disguise is upcoming on Cartoon, which has turned into one of the last strongholds of boys programming on cable, with multiple Lego shows on its air as well. Meanwhile, many of the older series are on Netflix, and Hasbro's apps are free. "On whatever air, on whatever screen you have, it becomes about an overall metric we can measure consumption by," says Christina Miller, president and gm of Cartoon, Boomerang and Adult Swim. "But the content is key. [Discovering new shows] is part of programming to multiple devices. If it's not any good, they're not going to come back."